Currently we only have this with SuperMax Crashproofing installed. The famous C-47. What could I possibly say about this workhorse? There are still some in service 70 years later! What more would you need to say about a plane like that? 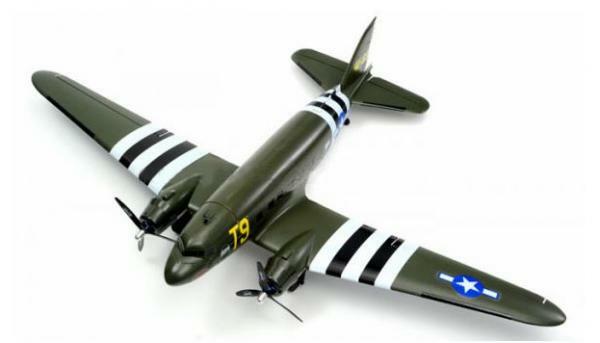 We have the Dynam built C-47- a nice foam job that they did will be kept intact by the nice carbon fiber job that we did. We have them in stock with reinforcement already installed, and the SUPERMAX kit in this plane increases the overall strength level by a 250% average, with a whopping 600% increase in compression resistance in the nose- all for an additional 18% weight. Gotta love it! Flies like a dream with this setup, more stable than the factory version, and closer to scale flight (meaning, it still speeds around in a very un-scale manner if you want it to).